Welcome to Gospelle! 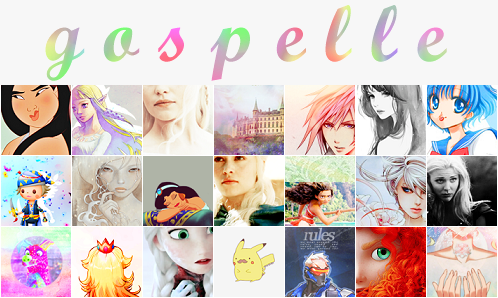 This is just my little graphic community I started in the small corner of Dreamwidth. You can find icons & moodthemes of video game and anime fandoms with the occasional icon artwork from various artists, which are listed on my resource page. The rest? Check out my tags. Thank you for stopping by! · Icon credit isn't necessary, but it's nice. · Please credit if you are using my moodthemes, thank you! · Textless icons are not bases, so please don't edit. · You may use my icons on forums or other sites.